By Allan Fox: Former IBF/WBC light heavyweight champion Chad Dawson (34-4, 19 KOs) and #8 WBC, #13 IBF Andrzej Fonfara (28-4, 16 KOs) have been added to the undercard of the welterweight unification fight between WBC champion Danny Garcia and WBC champ Keith Thurman on March 4 at the Barclays Center in Brooklyn, New York. It’s unclear if the Fonfara-Dawson fight will be shown on the televised portion of Showtime Championship Boxing or if it will be an off TV fight. The card has already got some good undercard fights on it already. I don’t know if you can call the Fonfara-Dawson fight a good match. Dawson, 34, has lost 3 out of his last 6 fights. Fonfara is coming off of a 1st round knockout loss to Joe Smith Jr. on June 18 last year. Fonfara was also beaten by WBC World light heavyweight champion Adonis Stevenson by a 12 round unanimous decision on May 24, 2014. 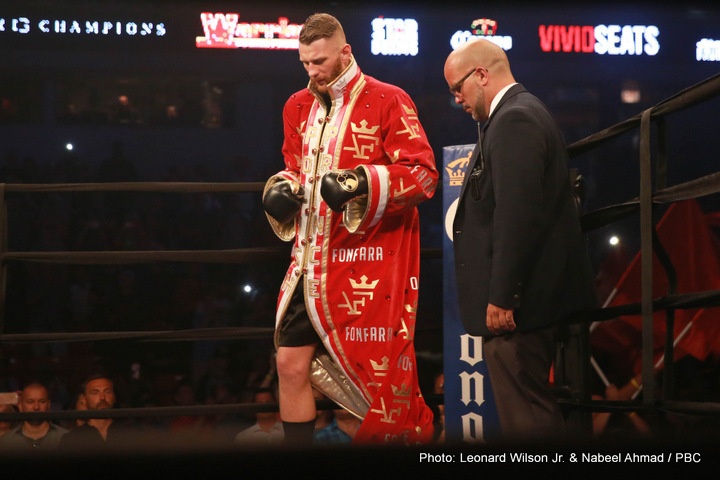 Fonfara’s wins in the last three years have come against Doudou Ngumbu, Julio Cesar Chavez Jr. and Nathan Cleverly. For his part, Dawson has won his last two fights against Cornelius White and Dion Savage. Before that, Dawson was beaten by Tommy Karpency, Adonis Stevenson and Andre Ward. Two of those losses were by knockout. “I’m told this fight will be on the #ThurmanGarcia undercard on March 4: Andrzej Fonfara vs. Chad Dawson,” said Dan Rafael on his Twitter. The Dawson vs. Fonfara would have made a lot of sense if it took place eight years ago when Dawson was still more or less in his prime. But Dawson’s career has been sinking in quicksand since 2010 when he was beaten by Jean Pascall by an 11 round technical decision. Dawson followed up that loss with a win over Bernard Hopkins and Adrian Diaconu, but he was then beaten by Andre Ward by a 10th round knockout defeat on September 8, 2012. After that loss, Dawson has struggled ever since with defeats against Stevenson and Karpency. Fonfara is now being trained by Virgil Hunter, the same trainer that trains Andre Ward out of Oakland. California. It would seem like an odd choice for Fonfara to be trained by Hunter. Fonfara is more offensive minded fighter, and it’s hard to know what Hunter will be able to do for him. So Hunter is having Fonfara do some “crazy drills”? I’m wondering how these crazy drills are going to help improve Fonfara enough for him to go far in the 175lb division. He was almost knocked out in the 1st round in his last fight by Joe Smith Jr. If Fonfara can’t even beat Smith Jr., then he’s certainly not going to be able to defeat guys like Artur Beterbiev, Ward and Sergey Kovalev. Styles make fights, but I don’t see Fonfara being able to beat the top guys in the division unless he improves dramatically overnight. Fonfara will likely beat Dawson without any problems, but that doesn’t mean anything because we’re talking about an aging fighter that has seen better days. Dawson isn’t the fighter he once was earlier in his career, and he’s likely going to implode right away on March 4 if Fonfara hits him with anything solid.